Just about everyone associates the Free Tibet movement with non-violence—specifically the 14th Dalai Lama’s “Middle Way.” However, that was not always the case and might not always be true in the future. 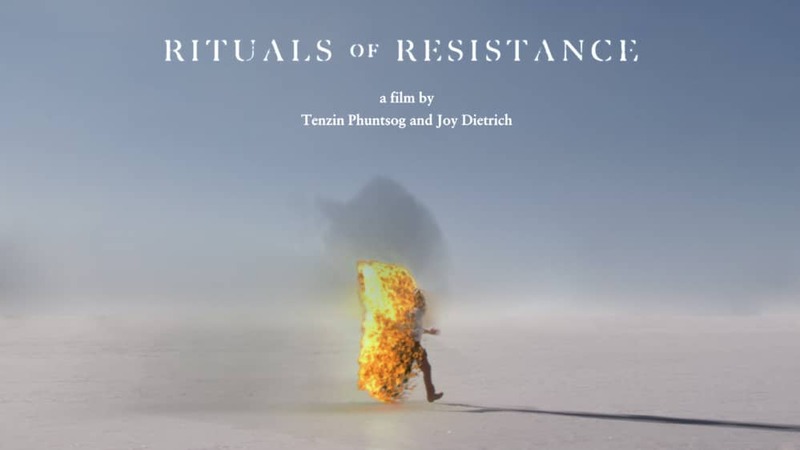 Three generations of Tibetan exiles represent three different response to China’s oppressive occupation in Tenzin Phuntsog & Joy Dietrich’s 63-minute short documentary feature, Rituals of Resistance (trailer here), which screens during the 2018 Margaret Mead Film Festival. They might have differing opinions regarding tactics, but the three exiled profiled all agree the Chinese invasion was a massive human tragedy. Tendar is a former Buddhist monk, who remains as devout as ever, but in the early 1960s, he renounced his vows to enlist in the Tibetan rebel army. He can even be seen leading a raid on a Chinese convoy in a rare British documentary. For Phuntsog’s mother Dolma, the personal is political. She risked certain imprisonment and possibly worse to sneak back into Tibet for a reunion with the brother and sister she had not seen since they were young children. Lakpa, born in the early 1980s will be the most troubling for many viewers, because he represents the increasingly prevalent self-immolation movement. Arguably, it is related to the nonviolent Middle Way, because it scrupulously avoids harm to others, but it obviously represents a very extreme and final form of protest. He did indeed attempt to self-immolate during Hu Jintao’s official state visit to India, but the authorities intervened. Resistance clearly demonstrates Tibetans are far from monolithic in their thinking. However, there are broad points of consensus, notably including the complete illegitimacy of the Chinese occupation and a reverence for the Dalai Lama (but not necessarily lock-step agreement with the course he has charted for the government in exile). Frankly, that is far more common ground than we share as Americans these days. Phuntsog is Tibetan-American, but through his three primary subjects, he and Dietrich piece together a mural portrait of the Tibetan national character. It also happens to be a rather sad and wistful film, because it definitely gives viewers a sense of the pessimism and weariness afflicting so many Tibetans, especially exiles (in this respect, they are quite like Americans, who have been mired in pessimism and negativity since the Clinton years). This is a deeply humanistic film, but it is also uncompromisingly truthful, which often makes it profoundly distressing. First and foremost, the filmmakers are determined to provide an opportunity for their subjects to tell their stories, but in the process, they convey of vivid sense of what life is like for Tibetan exiles and activists. It is a well assembled film, but sensitive viewers should be warned the filmmakers have incorporated some highly distressing news footage of the recent immolations. Get your sutras ready, because the experiences chronicled in Resistance will make you pray for Tibet. Beyond timely, Rituals of Resistance shows us what real “resistance” and real dissent look like. Very highly recommended, it screens this Sunday (10/21), with Tibetan Nomads in Exile, as part of this year’s Margaret Mead Film Festival, at the American Museum of Natural History.